Based on reviews from 2,678 users. 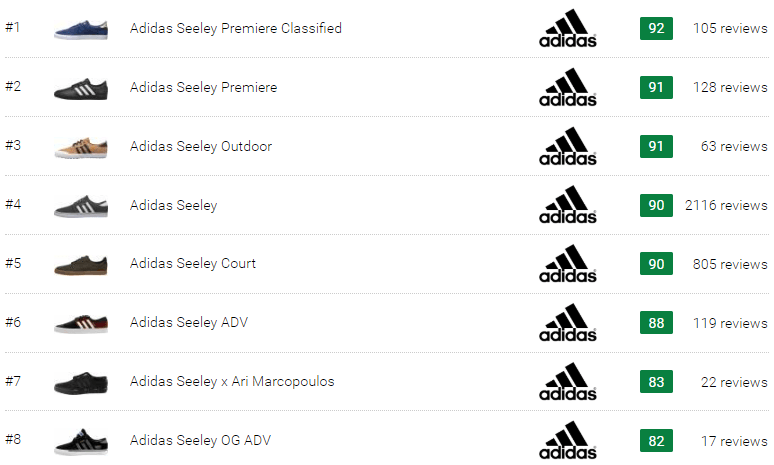 Learn how our rankings work or see our guide to Adidas Seeley sneakers. Updated Apr 2019. When it comes to sports, Adidas is known for offering a wide range of products. The brand has also been recognized for keeping in line with trends and creating something more. This was the case when Adidas decided to launch its skateboarding line, delivering stylish and high-quality kicks, clothes, and more for skaters and fans alike. The Adidas Seeley skate shoes are suitable for casual use, favored as they are for their minimalistic flair. For this reason, Adidas has continued to update the simple silhouette, offering different takes for different tastes. Additionally, these kicks come in a variety of colorways, from the basics: black, white, red, and blue to unique color combinations. When Adidas Skateboarding was first established in 1988, it was still under the Adidas Originals line. Apparel and footwear made especially for skating were produced under the label, which was then distributed to skateboarding retailers. One of the most iconic kicks to emerge from the Adidas Skateboarding line is the Adidas Seeley. The popular model has since been introduced in many iterations. Listed below are the most popular Adidas Seeley sneakers from the series. Released in 2011, the Adidas Seeley took inspiration from the iconic Adidas Gazelle. A classic boat shoe also inspired it. The original release came in monochrome all-black and all-white colorways. Vintage style and premium comfort are balanced in this skate shoe, enabling it to become a modern classic quickly. Canvas, nubuck or suede are the materials used on these Adidas Seeley sneakers, depending on the colorway. The extra-durable Adidas Seely is built to endure repeated wear and tear during skate sessions. These Adidas Seeley shoes in black were particularly favored for their sleek appeal. It’s priced at $65, making it budget-friendly. According to users, the shoe runs small and narrow. It comes in men’s 4-14. A smooth and luxurious nubuck leather upper elevates this model into sophistication. The slimmed down Seely Premiere Classified design is less bulky than other skate kicks. With its modern accents, this shoe is meant to be a contemporary take on a timeless sneaker. The board feel is improved by the Grippy Tread design and the Vector Traction Outsole. Synthetic overlays reinforce this shoe's pigskin nubuck upper for a more durable structure. It’s a very affordable model at $70. These Adidas Seeley men’s shoes are available in sizes 6-14, fitting true to size. This outdoor-appropriate model of the Seeley is a weather-resistant take on a beloved skate-inspired shoe. The classic details of the original are retained, while at the same time updating the sneaker with weather-resistant features. Its original colorways were Core Black and Mesa or brown. Incorporated on the outsole are radial patterns and deep lugs for more support and traction on the slippery or icy ground. This shoe features a weatherized gusseted tongue, which offers comfort while keeping the feet well-protected from dirt, water, and snow. These Adidas Seeley shoes in black were known for being very versatile, offering styling options for both dressing up or down. It was released at a highly reasonable price of $75. Sizes can be found in men’s 6-14. A few buyers have said that the sneaker runs narrow. The Adidas Seeley Premiere was released in 2013, a couple of years after the original model was first introduced. Adidas upgraded the silhouette with a premium nubuck upper, along with a woven Trefoil logo on the tongue. A slimmed-down profile is immediately noticeable, along with improved grip on the outsole. Comfort and shock absorption are provided by the Polyurethane sock liner. The toe panel is a one-piece structure that protects against grip tape friction. These Adidas Seeley sneakers have a low retail price of $70, offering much for its worth. Men’s sizes were issued for this shoe, ranging from 4-14. It is said to fit as expected. A neater and slimmer Seely construction is showcased in this model. Its suede or leather upper also has a deconstructed look, complete with textile lining for breathability and comfort. All of the updated features balance the original details, such as the vulcanized gum outsole and padded collar. The Three Stripes logo on this model is done in a perforated design, offering ventilation along with a striking look. Its price tag is $65, offering bang for the buck. These Adidas Seeley sneakers were released in men’s 4-14, with a generally true-to-size fit. Among the revamped features of the Adidas Seeley ADV are the vector-traction outsole, amplified toe cap, and molded polyurethane sock liner. The result is a skate shoe that can endure heavy skate sessions on an everyday basis. It’s also fit for the streets, enabling the wearer to always head out in low-profile yet timeless style. With this straightforward sneaker, simple and neat is the way to go. These low-key Adidas Seeley skate shoes have been praised for their improved board feel and excellent traction, brought about by the herringbone-patterned outsole. With a price point of $70, this shoe is budget-friendly. It comes in men’s sizes ranging from 8-13 and fits as expected. The mid-top version of the Adidas Seeley was released a few years after the original model. With its mid-cut collar, the shoe was built to deliver improved comfort and support for both skating and walking down the streets. In tribute to the first Seeley model, this sneaker features the same timeless profile. The mid-cut design also offers an edgy take on the enduring Adidas Seeley skate shoes. The jagged Three Stripes logo adds a retro touch on the shoe's lateral sides. It has a very affordable price point of $70. Available sizes are in women's 7.5-15.5 and men's 6-14. 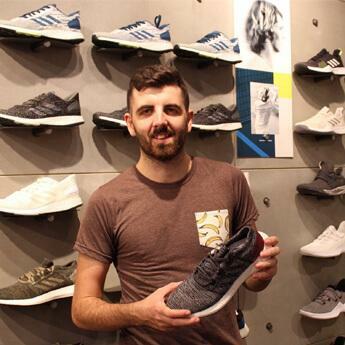 A few purchasers have noted that the sneaker runs narrow, suggesting that a half size or one size up would fit better. This version of the Adidas Seeley stays true to its name: it has all the essentials that made the original sneaker a classic, along with some updated details. The classic skate shoe look is showcased in all its glory, while the level of comfort is not compromised. A sophisticated yet casual flair can be easily achieved with a pair of these kicks. These Adidas Seeley sneakers incorporate a vulcanized gum rubber outsole that promises precise and much-improved board contact. This upper of the shoe is made up of a canvas material. At a low price of $65, this shoe offers much for its value. Several wearers have revealed that the model runs large by one whole size. Men’s sizes from 4-14 are offered. Debuting in 2015, this deconstructed edition of the well-loved Seeley has a minimalistic appeal. Its suede upper has a neat look, offering a lightweight and durable feel. The rope laces closure emphasizes the clean vibe. A contrasting leather heel tab adds an edgy accent. The vulcanized outsole offers the shoe’s trademark traction and pivot points. The rope-like laces of these kicks add a sporty touch. These Adidas Seeley sneakers offer bang for the buck with their $70 retail price. Sizes can be found in men’s 5-13. Several reviewers have commented that the model runs big. Along with many succeeding editions, there have also been a few collaborative versions of Adidas Seeley sneakers. The skate silhouette has proven to be very versatile, both on and off the board, and so the brand has decided to explore what more the model could offer. Below are a couple of the collaborations done on Adidas Seeley shoes. Photographer Ari Marcopoulos is known for his work in capturing candid pictures of artists, skateboarders, musicians. Adidas partnered with him to release a collection in honor of the skate culture of New York City. The collaboration resulted in a range of clothing, accessories, and sneakers, along with a magazine of snapshots that feature the Lower East Side. Adidas also released an iteration of the iconic Seeley model with the photographer. Fashion and sports are seamlessly accommodated in this shoe, with the signature minimalistic style of Marcopoulos taking front and center. Comfort is delivered by the PU sock liner and sublimated woven lining. This sneaker comes in a deep mono colorway. The midsole has a screen print foxing tape that features the film contact of Ari Marcopoulos. It has a reasonably priced retail price of $100. These Adidas Seeley men’s shoes are offered in sizes ranging from 7-15. They reputedly fit true to size. Up-and-coming pro skater Alec Majerus collaborated with Adidas to release another good update to the Seeley silhouette. The basics of the classic sneaker were kept intact, freshened up with the signature style of Majerus. Along with its simple and straightforward style, this shoe provides superior traction and a highly durable structure. Hints of court and skate heritage designs are found all over the sneaker, giving it a distinct vintage feel. Buyers have found these Adidas Seeley sneakers to be very versatile. The iconic Three Stripes logo stitched on the sides of this shoe has a serrated look. Inspired by the Adidas Adiease, this model has a higher foxing tape to make it more durable. Signature Majerus label branding is found on the tongue and lateral side. Its $70 price point makes it a very reasonably priced sneaker. Men’s 6-12 can be found. Women can go down by 1.5 sizes for a suitable fit. 1. How to clean Adidas Seeley shoes? Adidas has noted specific steps in effectively cleaning a pair of kicks, such as Adidas Seeleys. These are the recommended ways of getting rid of any stains and dirt without permanently damaging the shoes. Here are the important things to remember. Shake off the shoes and knock the outsoles off against each other to make sure that any loose dirt, dust or pebbles can be removed. These things can quickly get into the shoes, especially the soles. Use a bristle brush or an old toothbrush to wipe away more dirt on the soles. Create a mild solution consisting of lukewarm water and soap. An eco-friendly detergent is recommended. Use the mixture to wash the surface of the sneaker gently. A washcloth or brush could be dipped into the solution and lightly applied to the shoe, wiping or brushing off the stains. Rinse a piece of cloth in warm water and wipe off the remaining soap and stains from the sneaker. The shoe should be air dried at room temperature. Using a heater is not recommended as it could damage the material. Additionally, leather kicks should be cleaned with a leather polish to keep the material in good condition. This is not recommended for shoes not made of leather. Laces could be washed in a mixture of water and soap. Meanwhile, removable insoles could be aired out overnight. If there is still an odor remaining, sprinkle them with baking soda and brush them off a day later. 2. Where can one buy Adidas Seeley kicks? Adidas sells its footwear, including Adidas skate shoes from the Seeley collection, at its many retail stores and outlets all over the U.S. and around the world. The brand's items are also often carried by big department stores and footwear chains. For those who want to purchase online, the sneakers could be bought at the Adidas website or several online stores. 3. What are the materials commonly used in the Adidas Seeley collection? Leather, canvas, nubuck, and suede are the materials that are commonly used on Adidas Seeley footwear. The original model was made with either canvas, suede or nubuck material, with later editions constructed with a leather upper. 4. What is the price range of Adidas Seeley footwear? Most shoes in the Adidas Seeley collection are within the budget-friendly range. The price ranges from $65, such as the first Adidas Seely, up to $75, such as the weatherized Adidas Seely Outdoor. Collaborative kicks like the Adidas Seeley x Ari Marcopoulos are sold at a higher yet still affordable price, retailing for $100. 5. How could one style Adidas Seeley kicks? As skate shoes, Adidas Seeley models are highly versatile and are easy to style. Below are some styling tips on how one could dress the shoe up or down for any occasion. For the ladies, sneakers from the collection could be dressed down with jeans, shorts or athleisure wear such as joggers or leggings. The outfit could be completed with a t-shirt and denim jacket for a street-ready flair. Meanwhile, a pair of Adidas Seeley shoes in white could be dressed up with skirts or dresses, especially for the summer season. Denim or skater skirts would create a flattering look with the kicks’ slim profile. Due to their origin as skate kicks, sneakers from the collection could be styled with any skater outfit for men. Jeans, track pants, cargo pants or shorts, chinos, and more could be paired with the shoes, complete with t-shirts or pullovers and a light jacket. 6. Where are Adidas Seeley sneakers made? Adidas has officially acknowledged its operation of over a thousand factories worldwide. The majority of the shoes are produced overseas in such countries as Turkey, Vietnam, India, China, Indonesia, and Thailand. This kind of information can be gleaned from the “Made in…” label, which is usually found on the tongue of the shoe. 7. What is the fit and sizing of Adidas Seeley models? The majority of Adidas Seeley shoes are offered in men's sizes, usually ranging from 4-14. There are also models that are provided in ladies' sizes, ranging from 7.5-15.5, such as the Adidas Seeley Mid. The fit would depend on the model's style and construction, including the materials used. 8. How to properly wash Adidas Seeley skate shoes? Putting Adidas Seeley kicks in a washing machine is highly discouraged. The same principle applies to all kinds of Adidas shoes. This is because the sneakers could lose their shape, or in the case of Adidas Seeley shoes in white, their color. Damage could also be incurred on the material due to the harsh washing process. Instead, cleaning Adidas shoes would entail gentle washing. The process involves a washcloth dipped in a solution of warm water and mild detergent. 9. Are there celebrities who are fans of the Adidas Seeley range? 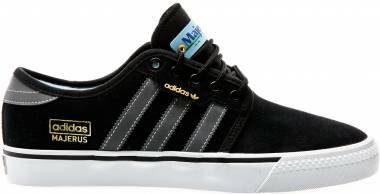 Celebrities have been known to favor the timeless style of Adidas skate shoes, especially from the Seeley collection. Among those who were seen out and about with a pair of Seeley kicks were rapper B.o.B, basketball player Iman Shumpert, actor Liam Hemsworth, and singer Perrie Edwards from the British girl group Little Mix. 10. What is the style of shoes in the Adidas Seeley collection? Adidas Seeley models were built as skate shoes. They were also initially inspired by the silhouette and design of the Adidas Gazelle. As such, the kicks in the collection have a distinct sporty style, amplified by the dominant Three Stripes logo on the lateral sides.